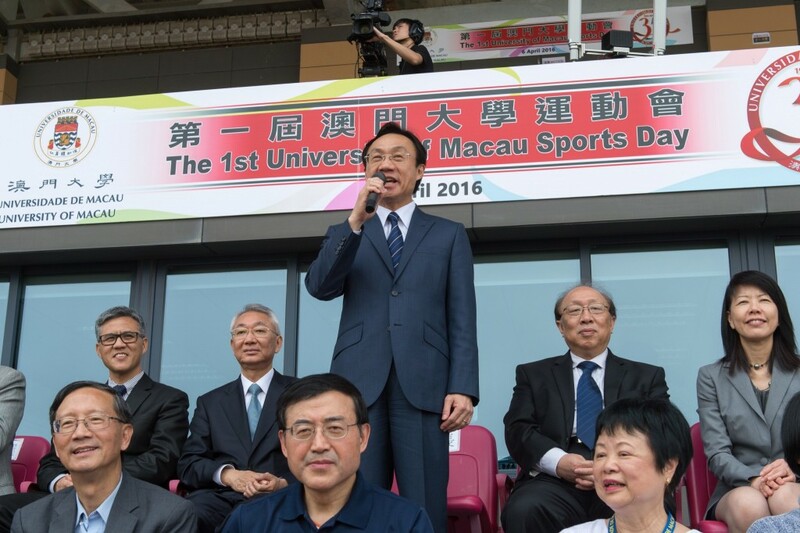 The First University of Macau (UM) Sports Day was held on 6 April in the UM Stadium. Secretary for Social Affairs and Culture Tam Chon Weng announced the opening of the event. In addition to Secretary Tam, who served as the judge for the cheerleading competition and officiated at the gun-firing ceremony for the track and field events, other officiating guests at the UM Sports Day included Ip Peng Kin, chief of the Office of the Secretary for Social Affairs and Culture; Heidi Ho, advisor of the Office of the Secretary for Social Affairs and Culture; Lam Io Pak, advisor of the Office of the Secretary for Social Affairs and Culture; Lam Kam Seng, chair of the UM University Council; Wei Zhao, rector of UM; Lionel Ni, vice rector (academic affairs) of UM; Rui Martins, vice rector (research) of UM; Haydn Chen, vice rector (student affairs) of UM; Kou Mei, vice rector (administration) of UM; Tommy Ho, vice chairman of the Board of Directors of the UM Students’ Union; and Qiu Yuxuan, chairman of the General Assembly of the UM Postgraduate Association. ‘Today is a historic day because it is the first time that UM has held its first Sports Day on the new campus,’ said Rector Wei Zhao in his opening speech. Rector Zhao added that the university implements a ‘4-in-1’ education model in order to provide holistic education to the students, and it also places a great emphasis on sports development through acquiring various sports facilities. He noted that the university hopes to gradually reach world-class standards in various areas, including teaching, research, student quality, and administration. 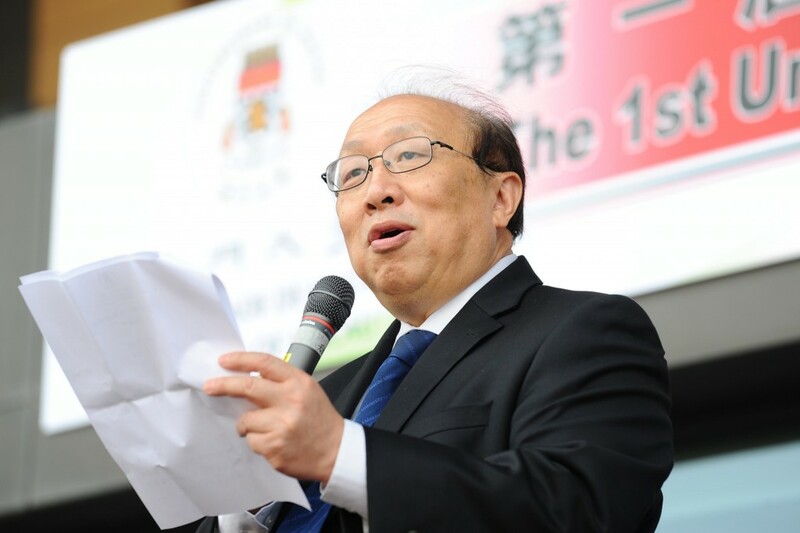 Rector Zhao added that all participants in the UM Sports Day were lucky, because they would have the opportunity to set the first athletic records in UM’s history. He also expressed hope that the participants would give their best and demonstrate good sportsmanship in the competitions. ‘I’m very happy to have the opportunity to participate in a sports competition where I work. It increases my sense of belonging,’ said Lantz, a staff member from the Chao Kuang Piu College who won the championship in the 1500-metre race in the male staff group A category. Lantz also thanked the college for its support and expressed hope that more students will cultivate the habit to exercise regularly. Ng Weng Ian, a second-year student who won the championship in the female students’ 100-metre race, said that the UM Sports Day felt like a carnival and the participant all enjoyed themselves very much. 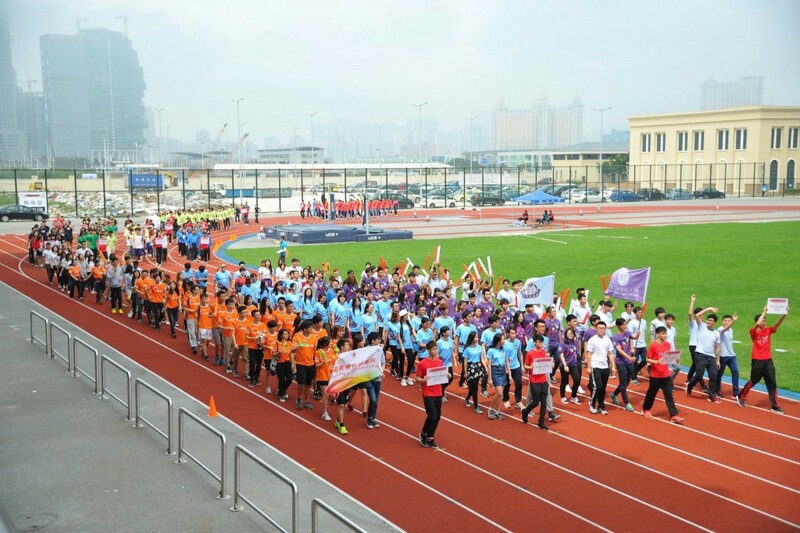 This year’s UM Sports Day attracted more than 600 participants, competing in 24 events in five categories for men and 24 events in five categories for women, including 100-metre race, 1500-metre race, 3500-metre medley relay, high jump, long jump, and shot put.